NC DHHS’ New Secretary – Yay or Nay? Our newly appointed DHHS Secretary comes with a fancy and distinguished curriculum vitae. Dr. Mandy Cohen, DHHS’ newly appointed Secretary by Gov. Roy Cooper, is trained as an internal medicine physician. She is 38 (younger than I am) and has no known ties to North Carolina. She grew up in New York; her mother was a nurse practitioner. She is also a sharp contrast from our former, appointed, DHHS Secretary Aldona Wos. See blog. Prior to the appointment as our DHHS Secretary, Dr. Cohen was the Chief Operating Officer and Chief of Staff at the Centers for Medicare and Medicaid Services (CMS). Prior to acting as the COO of CMS, she was Principal Deputy Director of the Center for Consumer Information and Insurance Oversight (CCIIO) at CMS where she oversaw the Health Insurance Marketplace and private insurance market regulation. Prior to her work at CCIIO, she served as a Senior Advisor to the Administrator coordinating Affordable Care Act implementation activities. Did she ever practice medicine? Prior to acting as Senior Advisor to the Administrator, Dr. Cohen was the Director of Stakeholder Engagement for the CMS Innovation Center, where she investigated new payment and care delivery models. 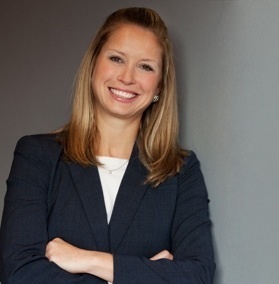 Dr. Cohen received her Bachelor’s degree in policy analysis and management from Cornell University, 2000. She obtained her Master’s degree in health administration from Harvard University School of Public Health, 2004, and her Medical degree from Yale University School of Medicine, 2005. She started as a resident physician at Massachusetts General Hospital from 2005 through 2008, then was deputy director for comprehensive women’s health services at the Department of Veterans Affairs from July 2008 through July 2009. From 2009 through 2011, she was executive director of the Doctors for America, a group that promoted the idea that any federal health reform proposal ought to include a government-run “public option” health insurance program for the uninsured. Again, I was perplexed. Did she ever practice medicine? Does she even have a current medical license? It appears that Dr. Cohen was issued a medical license in 2007, but allowed it to expire in 2012 – most likely, because she was no longer providing medical services and was climbing the regulatory and political ladder. From what I could find, Dr. Cohen practiced medicine (with a fully-certified license) from June 20, 2007, through July 2009 (assuming that she practiced medicine while acting as the deputy director for comprehensive women’s health services at the Department of Veterans Affairs). Let me be crystal clear: It is not my contention that Dr. Cohen is not qualified to act as our Secretary to DHHS because she seemingly only practiced medicine (fully-licensed) for two years. Her political and policy experience is impressive. I am only saying that, to the extent that Dr. Cohen is being touted as a perfect fit for our new Secretary because of her medical experience, let’s not make much ado of her practicing medicine for two years. That said, regardless Dr. Cohen’s practical medical experience, anyone who has been the COO of CMS must have intricate knowledge of Medicare and Medicaid and the essential understanding of the relationship between NC DHHS and the federal government. In this regard, Cooper hit a homerun with this appointment. During Cooper’s first week in office, our new Governor sought permission, unilaterally, from the federal government to expand Medicaid as outlined in the Affordable Care Act. This was on January 6, 2017. To which agency does Gov. Cooper’s request to expand Medicaid go? Answer: CMS. Who was the COO of CMS on January 6, 2017? Answer: Cohen. When did Cohen resign from CMS? January 12, 2017. On January 14, 2017, a federal judge stayed any action to expand Medicaid pending a determination of Cooper’s legal authority to do so. But Gov. Cooper had already announced his appointment of Dr. Cohen as Secretary of DHHS, who is and has been a strong proponent of the ACA. You can read one of Dr. Cohen’s statements on the ACA here. SECTION 3. The State will not expand the State’s Medicaid eligibility under the Medicaid expansion provided in the Affordable Care Act, P.L. 111-148, as amended, for which the enforcement was ruled unconstitutional by the U.S. Supreme Court in National Federation of Independent Business, et al. v. Sebelius, Secretary of Health and Human Services, et al., 132 S. Ct. 2566 (2012). No department, agency, or institution of this State shall attempt to expand the Medicaid eligibility standards provided in S.L. 2011-145, as amended, or elsewhere in State law, unless directed to do so by the General Assembly. Obviously, if Gov. Cooper’s tactic were to somehow circumvent S.L. 2013-5 and reach CMS before January 20, 2017, when the Trump administration took over, the federal judge blockaded that from happening with its stay on January 14, 2017. But is it a bit sticky that Gov. Cooper appointed the COO of CMS, while she was still COO of CMS, to act as our Secretary of DHHS, and requested CMS for Medicaid expansion (in violation of NC law) while Cohen was acting COO? New Revisions to Stark Law: Beware the “Per-Click Lease” – Maybe? Scenario: You have an arrangement with your local hospital. You are a urologist and your practice owns a laser machine. You lease your laser machine to Hospital A, and your lease allows you to receive additional, but fair market value, money depending on how often your machine is used. Legal? A new Final Ruling from the Centers for Medicare and Medicaid Services (CMS) provides murky guidance. CMS finalized the 2017 Medicare Physician Fee Schedule (PFS) rule, which took effect on January 1, 2017. There have been few major revisions to the Stark Law since 2008…until now. The Stark Law is named for United States Congressman Pete Stark (D-CA), who sponsored the initial bill in 1988. Politicians love to name bills after themselves! Absent an exception, the Stark Law prohibits a physician from referring Medicare patients for certain designated health services (“DHS”), for which payment may be made under Medicare, to any “entity” with which the physician (or an immediate family member) has a “financial relationship.” Conversely, the statute prohibits the DHS-furnishing entity from filing claims with Medicare for those referred services. Despite the general prohibition on potentially self-interested referrals, the Stark Law permits Medicare referrals by physicians to entities in which they have a financial interest in certain limited circumstances. But these circumstances are limited and must be followed precisely and without deviation. These exceptions are created by legally excluding some forms of compensation agreements and ownership interests from the definition of “financial relationship,” thus allowing both the relationships and the referrals. See 42 U.S.C. § 1395nn(b)-(e). One of such exceptions to the Stark Law is the equipment lease exception. For example, like the scenario above, a urology group owns and leases a laser machine to Hospital A. As long as the lease meets the criteria listed above, the urologists may refer Medicare patients to Hospital A to their hearts’ content – even though the urologists benefit financially from their own referrals. In a court case decided in January 2015, Council for Urological Interests v. Burwell, a D.C. circuit court decided that CMS’ ban on per-click leases was unreasonable. Considering how unclear the Final Rule is – We are banning per-click leases, but not absolutely – expect lawsuits to clarify. In the meantime, re-visit your equipment leases. Have your attorney review for Stark compliance – because for the first time since 2008, major amendments to Stark Law became effective January 1, 2017. Do the Anti-Kickback and Stark Laws Apply to Private Payors? 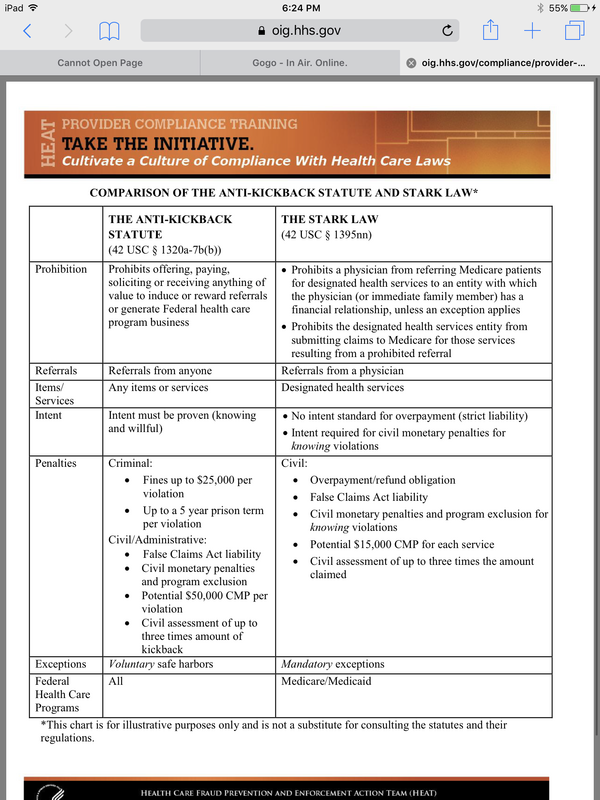 Anti-Kickback statutes (AKS) and Stark law are extremely important issues in health care. Violations of these laws yield harsh penalties. Yet, many healthcare professionals have little to no knowledge on the details of these two legal beasts. The most common question I get regarding AKS and Stark is: Do AKS and Stark apply to private payers? Health care professionals believe, if I don’t accept Medicare or Medicaid, then I don’t need to worry about AKS and Stark. Are they correct?? The general and overly broad response is that the Stark Law, 42 USC § 1395nn, only applies to Medicare and Medicaid. The AKS, 42 USC § 1320a-7b(b)),applies to any federal healthcare program. Is there a difference between AKS and Stark? Answer: Yes. As discussed above, the first difference is that AKS applies to all federal healthcare programs. This stark difference (pun intended) makes the simple decision to not accept Medicare and Medicaid, thus allowing you to never worry about AKS, infinitely more difficult. Let’s take a step back… What are AKS and Stark laws and what do these laws prohibit? When you Google AKS and Stark, a bunch of legal blogs pop up and attempt to explain, in legalese, what two, extremely esoteric laws purport to say, using words like “renumeration,” “knowing and willful,” and “federal healthcare program.” You need a law license to decipher the deciphering of AKS and Stark. The truth is – it ain’t rocket science. The AKS is a criminal law; if you violate the AKS, you can be prosecuted as a criminal. The criminal offense is getting something of value for referrals. You cannot refer patients to other health care professionals in exchange for money, reduced rent, use of laboratory equipment, referrals to you, health services for your mother, marketing, weekly meals at Ruth’s Chris, weekly meals at McDonalds, oil changes, discounted theater tickets, Uber rides, Costco coupons, cooking lessons, or…anything of value, regardless the value. Safe harbors (exceptions to AKS) exist. But those exceptions better fit squarely into the definition of the exceptions. Because there are no exceptions beyond the enumerated exceptions. AKS is much more broad in scope than Stark. Other than Medicare and Medicaid, AKS applies to any health care plan that utilizes any amount of federal funds. For example, AKS applies to Veterans Health Care, State Children’s Health Programs (CHIP), Federal Employees Health Benefit Program, and many other programs with federal funding. Even if you opt to not accept Medicare and Medicaid, you may still be liable under AKS. One other important aspect of Stark is that is considered “strict liability,” whereas AKS requires a proving of a “knowing and willful” action. Feel free to print off the above chart for your reference. However, see that little asterisk at the bottom of the chart? It applies here as well.